Outdoor spaces and patios beckon, especially when the weather gets warmer. First of all, they add to your overall available space, and secondly, they hold the promise of relaxation, entertaining, and overall more enjoyment. Buying outdoor furniture involves much the same steps as buying indoor furniture, but there are some additional considerations as well. Is your weather hot and dry, or do you live near the coast? Does it rain often? 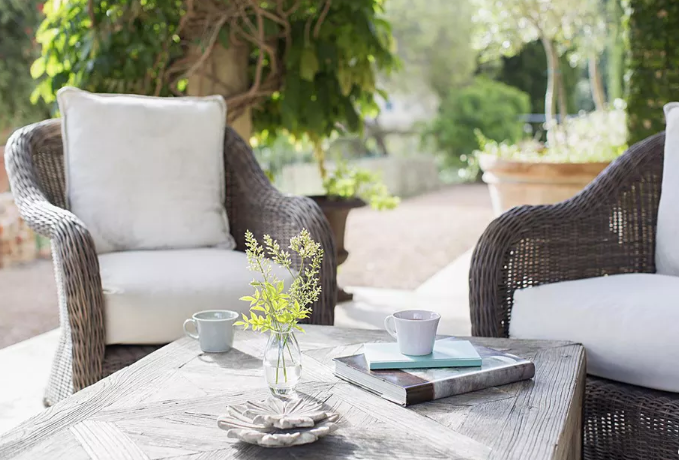 All these are important questions to answer before selecting outdoor furniture. Here’s why. Hot, dry conditions can make some wood splinter and crack. Strong winds can send aluminum furniture flying, and wicker will not withstand constant exposure to moisture. Consider how much space you have, and how it is shaped. Is it a long and narrow balcony or a broad and wide deck? Use the area and shape of your balcony, patio or porch to determine the size of your outdoor furniture. Make sure to leave enough space around your furniture to be able to walk comfortably. Apply the same principles for traffic flow that you would use indoors. For a small space, a bar table set may work better than a regular dining set, because bar tables are narrower, and stools take up less room than chairs. You can also take a look at cafe or bistro tables and chairs as they have a smaller profile. Is your patio or outdoor space exposed to the elements or do you have any overhead covering? Will your furniture rest on soft ground and grass or on a hard surface such as a wooden deck or a paved patio? This helps you choose materials that are a good match for your environment and surroundings. Do not place soft woods such as pine on a grassy surface and in an exposed area. The moisture from the ground can cause the wood to rot. Moisture can also cause some metals to corrode. Consider patio umbrellas for shade if you get too much sun. What kind of materials do you like for outdoor furniture? The three factors can help you decide are weather, the amount of care required, and how it looks. As mentioned above, your weather plays a big role in determining if a material is ​a good fit. You obviously don’t want a material that won’t stand up to your weather conditions. The amount of care that a material needs is also something you want to consider. Some outdoor materials such as aluminum, teak or resin do not need too much care. Wrought iron can last for a really long time and can take heat and moisture. Resin furniture is also impervious to damp conditions and is available in many different looks and finishes. You will be using your outdoor furniture to relax, so make it comfortable. Even if your chairs don’t come with cushions, you can buy or make your own cushions and pillows. Just make sure to use good quality outdoor fabric that is fade and mildew resistant. Your pillows will stay looking their best if you store them when you no longer use them outdoors in cooler months. Chaise lounges, rockers, ​and recliners are also great for relaxing outdoors. Make sure to try out your furniture before you buy it. For stretching out you may also want to look at hammocks and daybeds. Make sure that you can provide storage for your outdoor furniture for winter. Sometimes even covers will not provide enough protection, especially for materials like wicker. Either have storage space for your furniture or buy something that you will be able to use indoors during the winter months. Another option to cut down on storage space is to buy outdoor furniture that folds flat for storage. In the end your budget determines what you can buy. I cannot stress enough the importance of buying the best furniture you can afford. If you are economizing, there are some options you have that can ensure you get the best quality for your money. You can get very attractive patio furniture for less by the end of July and August as fall approaches. Consider materials that are less expensive such as aluminum or resin, or look for inexpensive woods. Check out yard sales or thrift stores and buy the best quality that you can find. Refurbished and cleaned, it can look better than new, and might even be better quality. You might also consider changing pillows and cushions to update old patio furniture.